In this nation, the unequal burden of disease among People of Color has been well documented. One starting point to eliminating health disparities is recognizing the existence of inequities in health care delivery and identifying the complexities of how institutional racism may operate within the health care system. 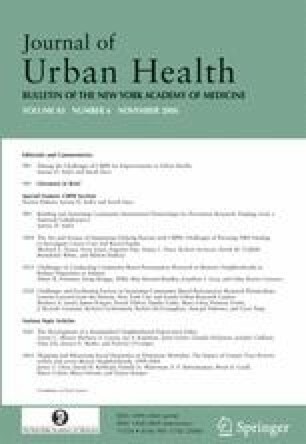 In this paper, we explore the integration of community-based participatory research (CBPR) principles with an Undoing Racism process to conceptualize, design, apply for, and secure National Institutes of Health (NIH) funding to investigate the complexities of racial equity in the system of breast cancer care. Additionally, we describe the sequence of activities and “necessary conflicts” managed by our Health Disparities Collaborative to design and submit an application for NIH funding. This process of integrating CBPR principles with anti-racist community organizing presented unique challenges that were negotiated only by creating a strong foundation of trusting relationships that viewed conflict as being necessary. The process of developing a successful NIH grant proposal illustrated a variety of important lessons associated with the concepts of cultural humility and cultural safety. For successfully conducting CBPR, major challenges have included: assembling and mobilizing a partnership; the difficulty of establishing a shared vision and purpose for the group; the problem of maintaining trust; and the willingness to address differences in institutional cultures. Expectation, acceptance and negotiation of conflict were essential in the process of developing, preparing and submitting our NIH application. Central to negotiating these and other challenges has been the utilization of a CBPR approach. Breast cancer Community-based participatory research Health disparities Institutional racism. Yonas and Eng are with the Department of Health Behavior and Health Education, School of Public Health, University of North Carolina, Chapel Hill, NC, USA; Jones and DuBose are with the Greensboro Health Disparities Collaborative, The Partnership Project, Greensboro, NC, USA; Vines and White are with the Program on Ethnicity, Culture, and Health Outcomes, University of North Carolina, Chapel Hill, NC, USA; Aronson is with the Department of Public Health Education, University of North Carolina, Greensboro, NC, USA; Griffith is with the Department of Health Behavior and Health Education, University of Michigan, Ann Arbor, MI, USA; Vines is with the Department of Epidemiology, University of North Carolina, Chapel Hill, NC, USA. People’s Institute for Survival and Beyond. Dedicated to training and organizing with intelligence and integrity-with values and vision. (2006) Available at http://www.pisab.org. Accessed on October 2, 2006.